Production I.G’s Blood-C: The Last Dark is, chronologically speaking, he first anime to come out this summer season. Although it is a movie and not a TV series, this instalment from CLAMP’s story will once again bring a lot of pleasant surprises to the crowds… at least that’s how it seems to be right now. As June 2, 2012 is nearing with each day, I decided to hurry up and instead of commencing with a TV series, present you the summer 2012 anime preview for this vampire-related anime film. Saya Kisaragi and Fumito Nanahara return from the series to present us with the exciting protagonist-antagonist relationship that was revealed in the least few moments of the original series. 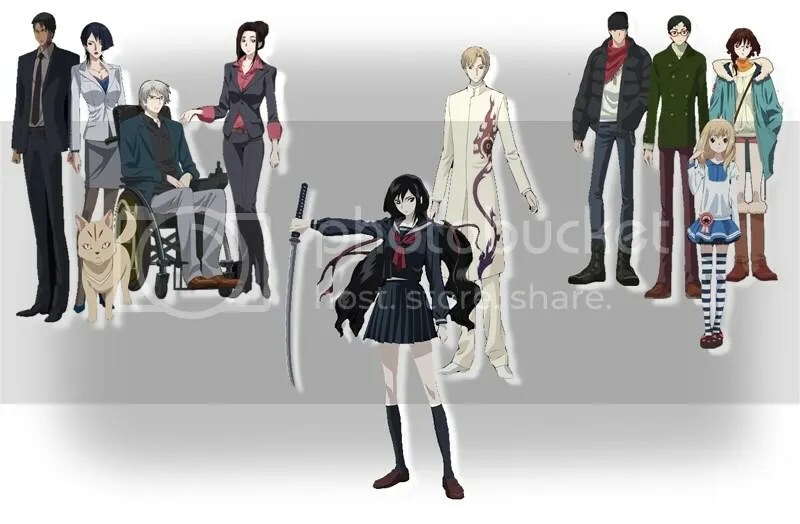 As noted, Blood-C: The Last Dark is a sequel to the Blood-C TV series from 2011. The story of Blood-C and the upcoming film centres around Saya Kisaragi who is Ukishima Shrine’s maiden. She lives in the shrine with her father Tadayoshi Kisaragi while at the same time attends classes at the Sanbara Academy. Playing the part of a nice high school student, Saya is actually a possessor of superhuman abilities and the keeper of the balance in the region. Doing her homework or killing Old Ones is her everyday dilemma. Together with her bloody battles we are also seeing her everyday life at the Academy, spent alongside her classmates: the twins Nono and Nene Motoe, Yuuka Amino, Shinichirou Tokizane and Itsuki Tomofusa. The movie begins after the events from the series and we have Fumito as an already developed antagonist and evil mastermind. The new experiment will be more dangerous and more cruel than the last one and he is using Old Ones for it. Kutou is the head of the task force unit in Tower. For many generations has his family served Fumito’s. He is an able fighter and bodyguard for Mr. Nanahara and is also magically enhanced in order to be invincible. Yuuka Amino is strict and respectful, but also very annoyed at Saya in the beginning. She’s 28 years old now. Inu (Dog) is actually xxxHolic’s Kimihiro Watanuki who’s taken this form to grant someone’s wish and to protect Saya. He’s always around her. Kutoto Mogari is the president of Sysnet (the biggest IT venture company) and a supporter of SIRRUT. He has a history of hatred with Fumito and blames him for his disability. Haruno Yanagi is a member of SIRRUT. She’s 24 years old. Saya Kisaragi is the shrine’s maiden and a chiropteran slayer. As a student she lacks common sense, especially when it comes to romance. Fumito Nanahara is the series’ owner of Guimauve and the main responsible for the experiment that creates disbalance around Saya. He is the movie’s main antagonist ad already a very powerful and developed villain in the region. Iori Matsuo is a 19-year-old member of the self-established organization of SIRRUT. Shun Fujimura is an 18-year-old member of SIRRUT. Hiro Tsukiyama is a 13-year-old member of SIRRUT (the youngest known so far). Mana Hiiragi is another young member of SIRRUT. She’s 17. And the team of セブンスセブン! The production committee has been making a huge effort to promote this movie and it has paid off. Even I dared calling the chibi versions of the Motoe twins from the videos ‘my favourites’. I cannot promise something exceptional, but I do think that everyone who is at least a bit interested in CLAMP’s works or the Blood franchise should check it out. I hope that I have the chance to see it sooner than later (NicoNico is streaming it pretty early with English subtitles) and make a reviews, but until then – I hope we all have some great time with Blood-C : The Last Dark’s officially streamed videos. There’s only one thing that tortures me from the moment these preview videos started – which one of them is Chan-Chan? !